Varanasi is one of the most fascinating cities in India to visit. It's a sacred destination for Hindus and Jains and is one of the oldest continuously inhabited cities in the world. 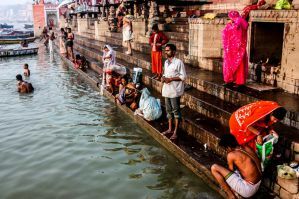 The sacred Ganges River is a unique setting that may be a bit of a culture shock for international travelers. The flow of pilgrims to the area and the historic buildings that line the river are one of the most impressive sights you may ever encounter. It is best to visit Varanasi between the months of October and March when the weather is cooler. Most visitors choose to stay near the ghats in the oldest part of the city. This area is the most conveniently located for visiting the river, but the hostels and hotel are often in older buildings and the quality may be lower. It's also possible to stay near the train station where buildings may be newer but the location is not as convenient. How much do hostels in Varanasi cost? The Ram Bhawan Residency is actually a cultural center in Varanasi that hosts home stays for visitors. It is affiliated with two different NGOs: the Varanasi Heritage Foundation and the Kautilya Society. If you wish to stay at this facility you have to become a member of the Varanasi Heritage Foundation. This is an additional fee that supports the organization. All of these proceeds go towards funding these organizations. Ram Bhawan is a pleasant place to stay that has a peaceful and relaxing setting. It's located in an 80 year old four storey house that has been built with traditional Indian architecture. You can enjoy views of the Ganges River from the terrace and it sits along an alleyway in Varanasi's old city. It's right beside Dashashwamedh Ghat (which is the main ghat). Included in the price of the room is breakfast and lunch (every day except Sunday when only breakfast is served. There is also a shared kitchen and wi-fi available. This is a unique place to stay in Varanasi and it will offer you a unique perspective on the city. There are both private rooms and dorms available. Private rooms include singles and doubles. Dorms sleep two or four people. International Travellers Hostel in Varanasi offers visitors the unique opportunity to stay with a local family but still enjoy the benefits of a traditional hostel environment. This is a family run hostel that's been in the family for more than five generations. It's located in a historical house where you can meet other international travelers but also enjoy the benefits of staying in a traditional Indian home. The hostel has a small restaurant that serves both Indian and western food and is opened from morning until night. There is also free wi-fi available, drinking water, and a fully equipped kitchen which guests can use. Bathrooms have hot and cold water. There's a common room with a television, dvds, and board games as well. If you want to hang out outside, there's a garden with outdoor furniture and a swing. There's also a large rooftop with a nice view. The hostel has double and twin private rooms as well as four and five bed dorms, some co-ed, some female only. Stops Hostel Varanasi is another popular hostel in Varanasi. It's part of a chain of hostels that are found throughout the country and it has a social and relaxed setting. It's a great place to relax and escape the chaos of the city. There are often other travelers hanging around that you can chat with and swap travel stories. The staff and other travelers can also offer advice and suggestions for the next steps of your trip. There are several great places where you can relax with a good book. There's even a library where you can borrow books and there are a handful of documentaries about India that you can watch. There are also balconies and verandas if you hope to spend some time outside. If you'd like to cook some of your own meals, there is a full kitchen available that guests can share. The hostel also organizes a handful of events for guests including Bollywood nights and Indian style cook-outs. They also host local music events or cultural activities. If you'd like to volunteer with a local NGO while you're in Varanasi, the staff can help you organize this as well. Private rooms and dorms are available. Dorms sleep six, eight, or fourteen people.